Sea stars prefer the lower reaches of the rocky shore and are most common below sea level in the Low Tide Zone. The ochre sea stars, found in rich shades of orange, brown and rose, venture through the Mid Tide Zone, clearing shellfish and thus leaving room for the aggregating anemone clones. A closely related species, the giant sea star, Pisaster giganteus, can also be found in the lower pools and comes in shades of blue and purple. 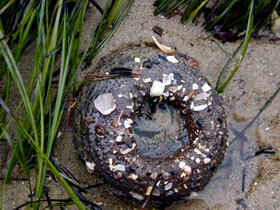 It is also a mussel predator, but cannot withstand the desiccation of the Mid Tide Zone as well as the ochre sea star. 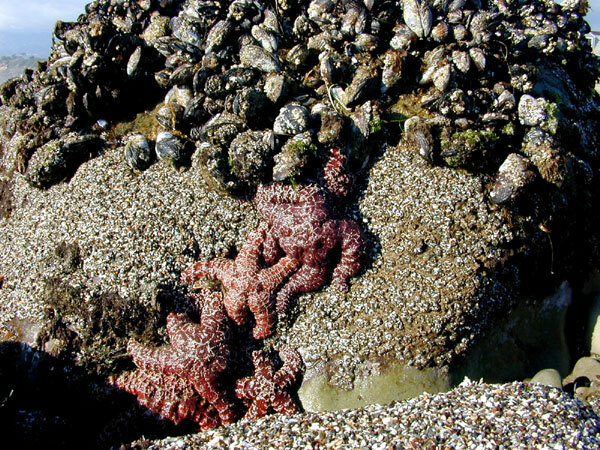 Several other sea star species are commonly found in the Low Tide Zone like the bat star, leather star and sunflower star. One of the few flowering plants in the ocean is surfgrass, Phyllospadix torreyi. 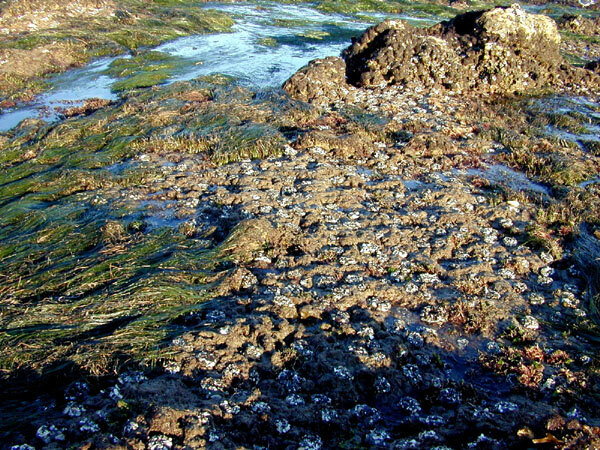 It is on almost every Santa Barbara shoreline that has rocks and waves at sea level. Not able to withstand much desiccation, this plant grows much like garden grass, sending out lateral runners along the surface and establishing new plants, creating masses of vibrant green at sea level. During minus tides the surfgrass is left dry for a short time, but is a wonderful visual cue to where sea level is located. As a photosynthetic plant it creates oxygen as a waste product of photosynthesis. 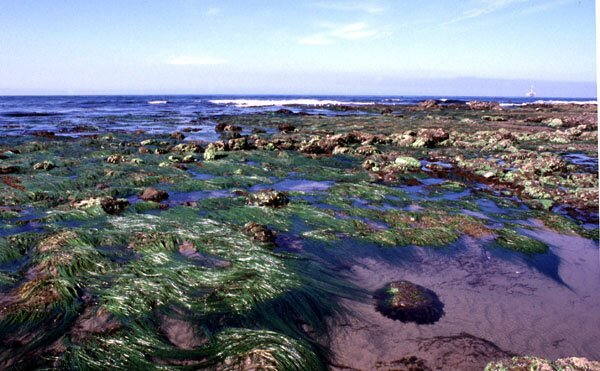 Normally this is washed away by the ocean currents, but at a minus tide, surfgrass in still tidepools on sunny days is covered with bubbles of pure oxygen. 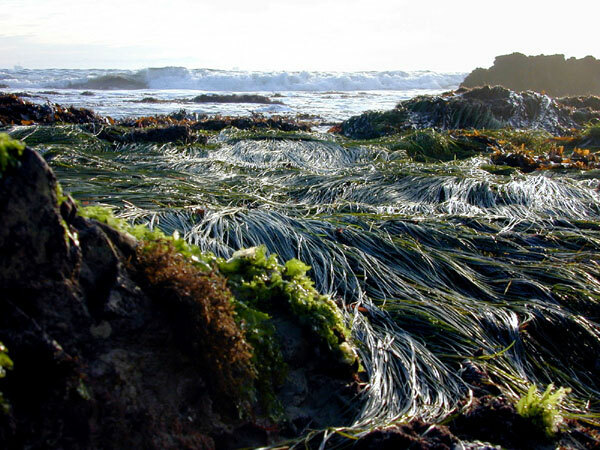 It is fun to look through the strands of surfgrass for the 'treasures' hiding in the low tide pools. 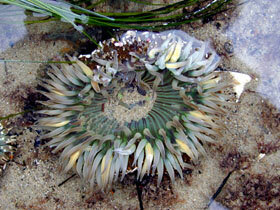 Before we get to the 'treasures', you should be introduced to the starburst (or sunburst) anemone, Anthopleura sola. 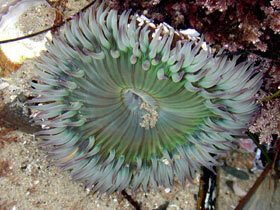 Closely related to the aggregating anemone, this species was given its own name only recently. 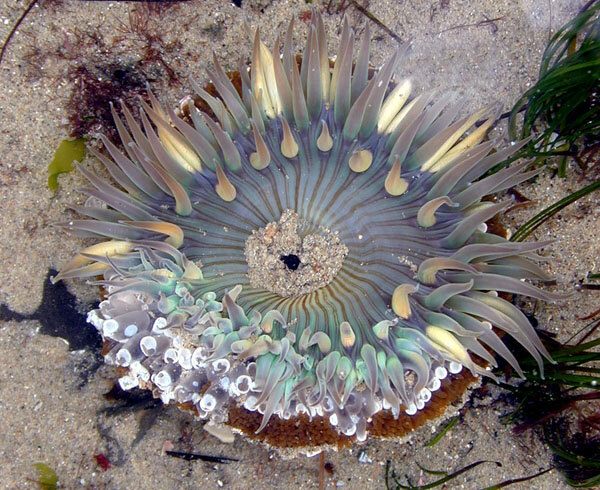 Up until then it was known as a form of aggregating anemone that lived below sea level in Southern California and did not clone, remaining solitary. 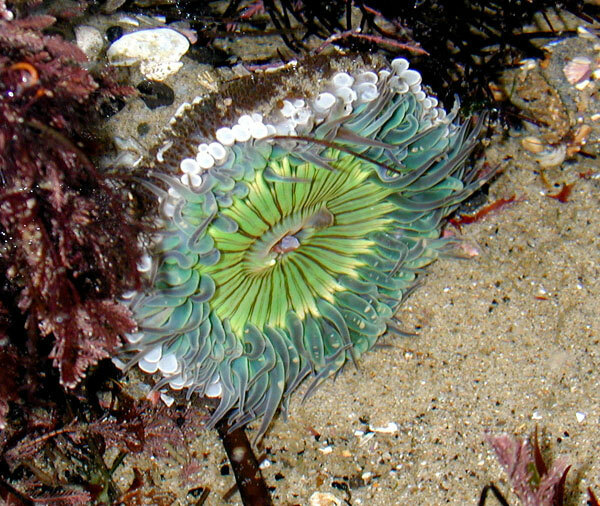 There is another solitary sea anemone that looks similar, called the giant green anemone (Anthopleura xanthogrammica) that lives intertidally in the cooler waters of Central and Northern California but it lacks the radiating lines on the oral disk and is generally not found in Santa Barbara tidepools. 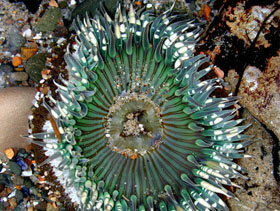 The starburst anemone also has fighting tentacles, called acrorhagi, just like the aggregating anemone. It fights with its neighbors, using these acrorhagi, to remain a little more than tentacle distance apart. If two starburst anemones touch their feeding tentacles they inflate their acrorhagi (generally deflated and hidden between the feeding tentacles and the side of the anemone) and fight until one of them moves. Thus they maintain even spacing in the Low Tide Zone. 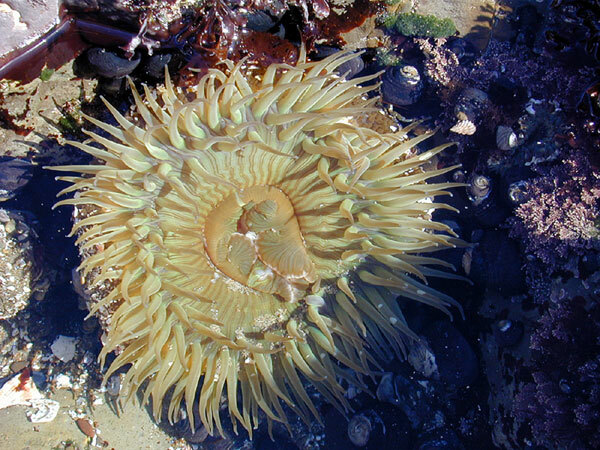 When tidepooling it is the starburst anemone that may often be caught in the middle of a fight, with its white, blunt acrorhagi inflated. As they fight (touching each other with their acrorhagi) the white areas of the acrorhagi become tattered. The white is a concentration of stinging cells and when touched, to an enemy, it will slough off - to keep on stinging the enemy again and again. 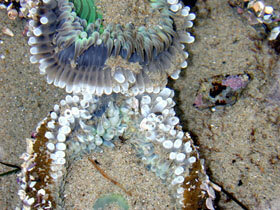 Eventually one anemone moves away from the tentacle-reach of its neighbor to stop the fight. 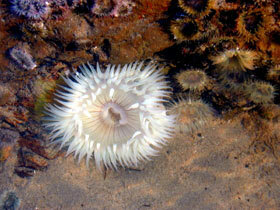 The starburst anemone is rarely found above sea level. 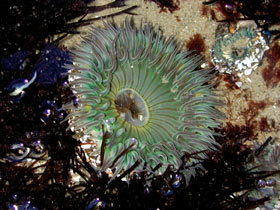 At low tide you often must walk on top of the starburst anemones while exploring the tidepools of the Low Tide Zone. Remember that each day all of these species are battered by the waves so your gentle foot is not much when compared to crashing waves. These are a hardy species. It is interesting to look at the different color patterns on the tentacles and oral disks of these starburst anemones. 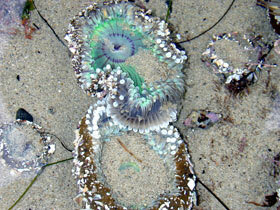 The various shades of green come from natural pigments produced by the anemone. 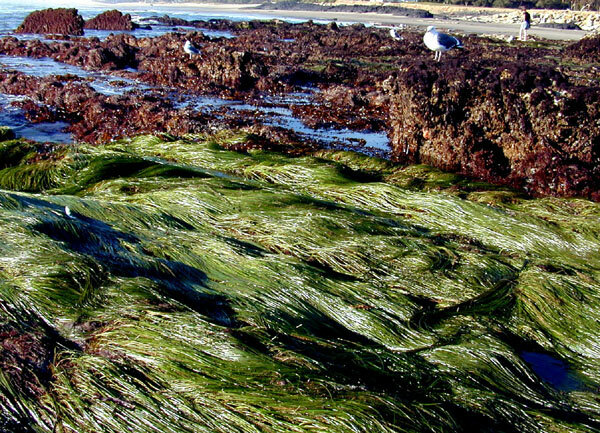 It was once thought that this green color combined with symbiotic algae growing in their tissues but this is not the case. 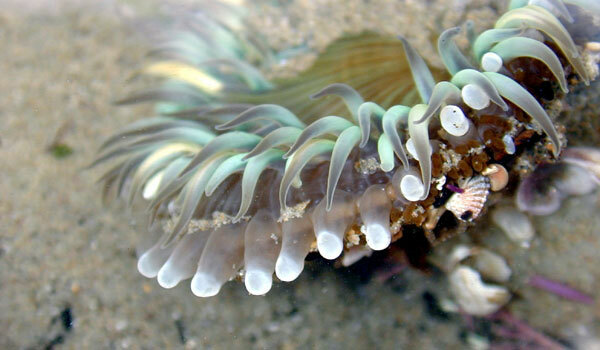 Anemones found under rocks or in the shade have little green color so are generally very pale (so there must be a need for light to manufacture their green pigment). The shades of green are very different, some even seeming to glow. 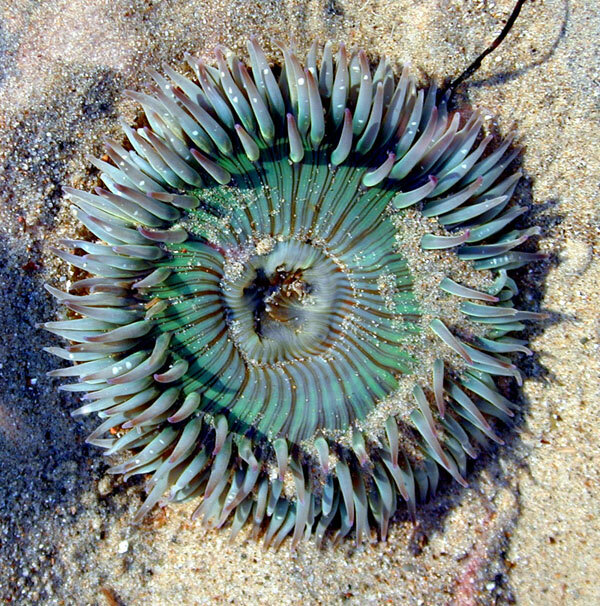 The various striping on their tentacles is genetic and serves to show how each is unique (unlike the clones of aggregating anemones where each clone member is identical).